Been hearing so many positive feedback about Arc Mobile, most of them claim the durability and sleek design of Arc Mobile Phones and Tablets. Arc Mobile Tab 720M 3G has some unique features compare to other Philippine made tablets like the 3G for instance its like having a phone and tablet at the same time, so wouldn't bother leaving your smartphone in home sometimes. Powered by dual core processor, so that Arc Mobile Tab 720M will not cause lag while playing games and videos, but there is one thing that this tablet is lacking, and that's the analog TV tuner, not to worry that much since Arc Mobile has countered this lack of TV with its 3G connectivity at a very affordable price of Php5,599 SRP. 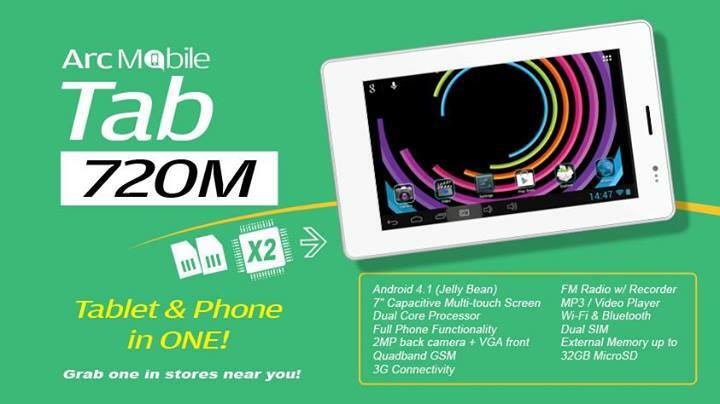 Arc Mobile Tab 720M 3G is priced at Php5,599 SRP | Available in the Philippines nationwide. To conclude, Arc mobile 720M has already a decent specs, although the price is not that much cheap just be glad its only Php5,599 since tablet with Wifi+3G connectivity will cost more than that, and the call and text function is the best there is.